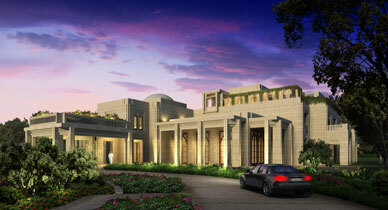 Description: Artifex10 was commissioned as lead resort landscape architect for a 3 hectare Abu Dhabi Palace Design. This resort style design is located on the south coast of Abu Dhabi Island creates a contemporary interpretation of traditional Islamic garden principals. A key component of the design is a lotus pool at the entry to the villa that creates the illusion of a building floating on water.The site plan incorporates two separate living villas, a shared health club, caidal tent, tennis court, swimming pool, multiple gardens, water features and event lawns. Plant material was selected to provide visual interest by using color, texture and patterning, while respecting the arid climate and create comfortable spaces throughout the site.